Working out by lifting weights or performing push-ups is an effective way to increase the strength in your arms. While exercise and strenuous physical activity can be uncomfortable at times, the presence of bruising or bleeding on your arms may be a sign of another medical condition or injury. Bruising or other marks on your body might also not be associated with your exercise itself and may instead be a sign of a previous injury. 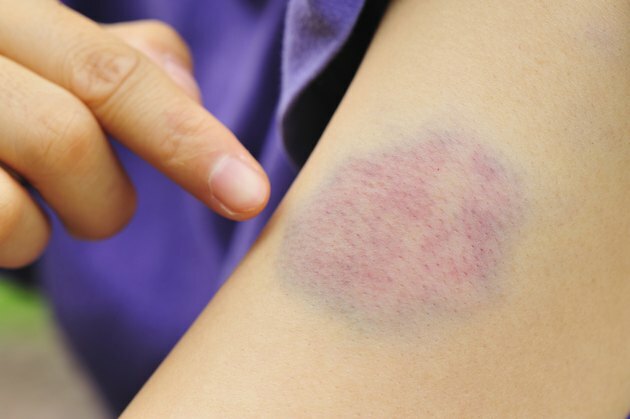 Bruises result when blood vessels near your skin's surface leak a small amount of blood into the surrounding tissues. This injury is often caused by a blunt force or trauma to your skin. Bruises on high-contact areas of your body -- such as your hands, feet, legs and arms -- can be relatively common. However, other factors such as injury, side effects to medication or other cardiovascular issues may also cause bruising on your arms during or shortly after exercise. As stated on the American Osteopathic College of Dermatology website, arm bruising can be common in people of all ages. Actinic purpura is a condition that causes flat, red blotches to occur on your arms and hands and can eventually turn into a purple bruise. Over time, these blotches will fade away and your skin pigment will return to normal. As such, this condition is not cause for medical concern and may not be directly related to exercising your arms. Instead, it is seen as a normal skin discoloration that can become more frequent as you age. Symptoms and signs of bruising on your arms after working out can include pain, swelling, redness and skin discoloration. If you have recently experienced a trauma or injury to your arms, bruising is a common bodily reaction, according to the MedlinePlus website. Extreme pressure in the area of your bruise, however, may be the sign of a condition called "compartment syndrome," which can cause additional cardiovascular risks if left untreated. Working out or performing strenuous physical activity with your arms can cause an increase in blood flow to the vessels and muscles. As such, any recent bump or injury to your arms may present with increased bruising due to increased blood flow to this area. Treat your bruise by applying a cold compress or ice wrapped in a cloth to your injured skin, according to MedlinePlus. You can also elevate your arm above the level of your heart to limit further swelling.